I've been a critic of AGA, I'm an Essex commuter and a huge fan of nationisation. But I'm delighted. Some of the real gains have not been picked up on. For example, a lot of off peaks will be 10 car instead of 8. 42 full length trains verses 26 scheduled now (and that includes the 9-car Norwich trains). 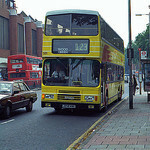 Aircon throughout, free Wifi, 3 tph to Norwich, dedicated long distance EMUs for Essex lines (I remember the 309s too). I could scream at some of my fellow commuters. Given you pop up on Railforums.co.uk I can think of one person there worth screaming at. We haven't even got a train spec yet and already the new Norwich trains are an unmitigated failure according to said person. Unbelieveable. This is clearly a very ambitious package for Abellio to deliver but if it all works then there will be a step change in services in about 5 years time (after everything has bedded in). The other clever thing is that there is an element of future proofing in the rolling stock decisions which makes a pleasant change from the old "just enough to cope for now" approach employed for so many years. Ha, yes, I know who you mean. Incredible reaction from some we could mention on there. Currently sat on an AGA train. It's clean, loads of seats available and bang on time. It's really not a bad service most of the time. ...so not selling their London bus operations any time soon? The destination of this thread has changed. Please listen for further announcements. Isn't it the case that there is always a "stand still" period for all major public sector contracts? I haven't seen anything that says that the DfT and Abellio have signed the franchise contract yet so no one is going to sign rolling stock deals until that happens. The announcement was purely one of "preferred bidder". Abellio now confirmed as the new operator of the Anglia franchise. Standstill period has been cleared and contracts signed. I expect rolling stock deals will be announced in due course. However, it's points off for the "ironing board" seats in the Aventras! Shame the seat layout doesn't align with the windows in First Class on the Norwich line and as for tip up seats in Standard Class. I can hear the riots starting already. The external livery looks decent *provided* trains are washed regularly and properly. It will look ghastly if the trains end up with the usual metalic streaking from repeated running in rainy conditions as afflicts much of the older rolling stock. I understand why they've retained 3+2 seating on commuter stock but those seats don't look comfortable and don't reflect the fact that people's body sizes are getting progressively larger. I'm also dubious about the use of 3+2 seating when so many routes have large numbers of standees regardless of train lengths. Makes it very hard for people to get to / from seats if they are alighting at intermediate stops. That then increases dwell times which reduces line capacity which is the last thing that's needed on many of Greater Anglia's given the ambition to run more services without infrastructure investment. Doesn't add up I'm afraid. Next up are the Aventras which were also included in the consultation. Rumours abound that GA are reconsidering the loss of first class on the Aventras. I think some influential types may have voiced discontent at having to sit with the commoners in 3+2 seating. It was a brave decision but as I pointed out in my response to the consultation, some people I know have 1st class tickets not because they are rich but because of health problems that mean they need a guaranteed seat with plenty of legroom. And if my arthritis gets any worse (it's keeping me awake tonight) I'll be one of them.